Runners, joggers, dog-walkers, and anyone else who likes to, or has no alternative but to, walk is feeling the squeeze. Hostility toward the idea of public trails has reached the point where even trails needed for public safety reasons (like giving kids safe, traffic-free routes to school) may be doomed. 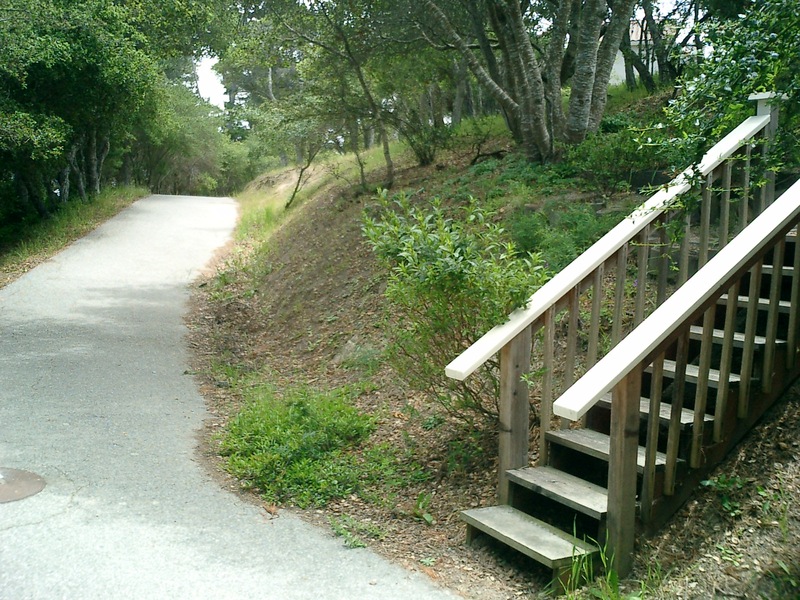 With this in mind, we can’t say we were surprised when we heard that Monterey’s Huckleberry Hill Homeowners Association was seeking a court order against a Mother’s Day hike on a trail the public has been using for longer than anyone can remember. Wait a minute … is someone in that neighborhood actually crazy enough to confront people for walking on a trail that’s been in use for decades? This we had to see for ourselves …. The trail begins. You’d think there’d be some warning about the dangers to come, but instead the message is clear: Hiking allowed, fires not allowed. Vandalism! We reach the first viewpoint and sure enough someone has vandalized it by putting up a bright red No Trespassing sign. The sign, which clearly refers to the woods below the trail and not to travel on the trail itself is completely pointless since no one would be likely to leave the trail and crash off into the brush here. Someone has attempted to ameliorate the vandalism by painting the sign a less offensive green color, but the vandals have apparently returned and washed the green paint off. It seems peaceful, but you never can tell. Violent confrontation could be waiting around the next corner. For all their complaints, the people in the Huckleberry Ridge neighborhood seem to use the trail quite a bit. 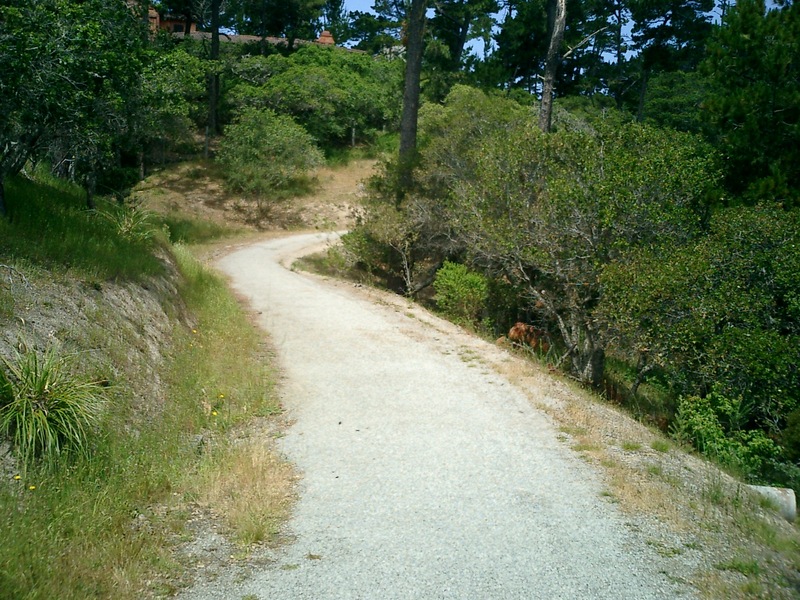 Numerous routes like this one connect the neighborhood to the main trail. 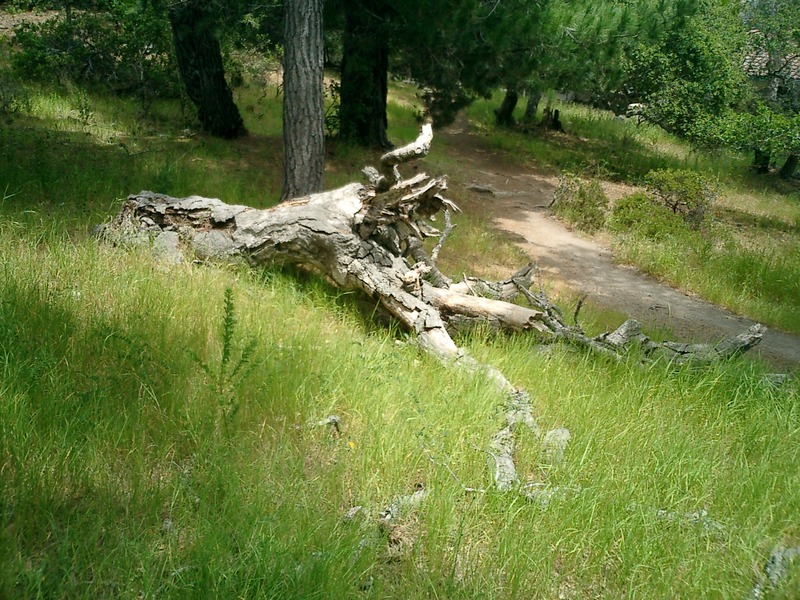 Some people have built themselves still more luxurious personal access to the trail. 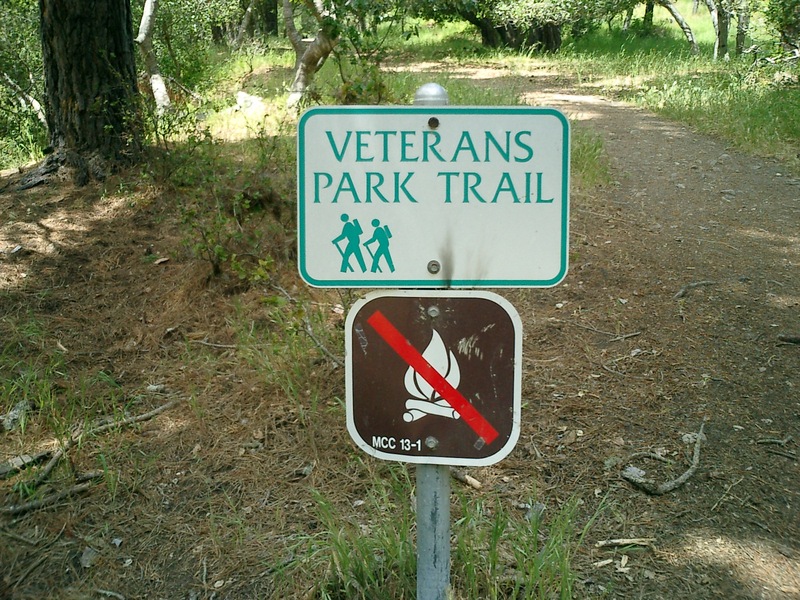 We reach the Veteran’s Park end of the trail and are ready to return. More vandalism! 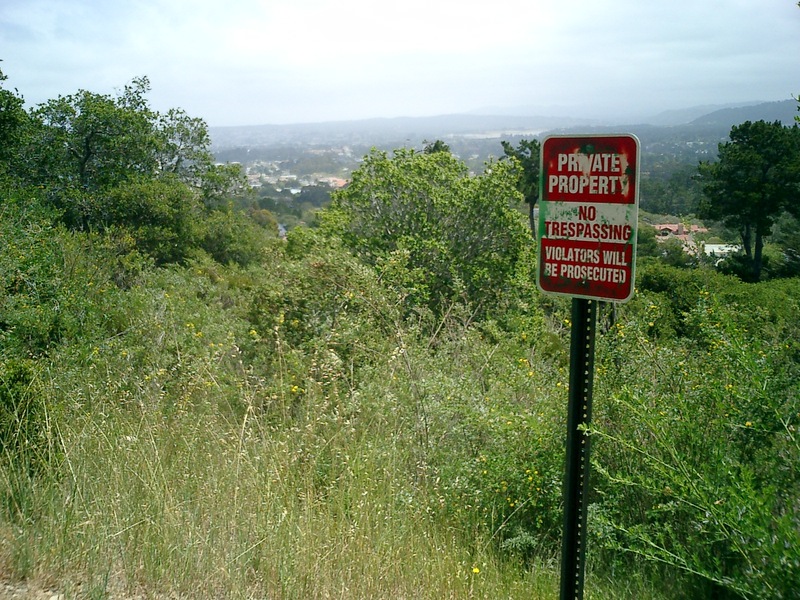 Do people really need to be threatened with prosecution to keep them off a steep, poison oak tangled slope? Almost back to Quarry Park and we find the remains of an oak tree in a meadow near the spot where we photographed another oak just after a fire in 1974. Historic 1974 photo showing even more extensive and more heavily used trail network. We’ve traversed the Trail of Contention in both directions and not only avoided violent confrontation, we’ve avoided meeting anyone at all. Vandalism aside, it wasn’t exactly the trouble spot we’d been led to believe. So what is going on with the Quarry/Veteran’s Park Trail? 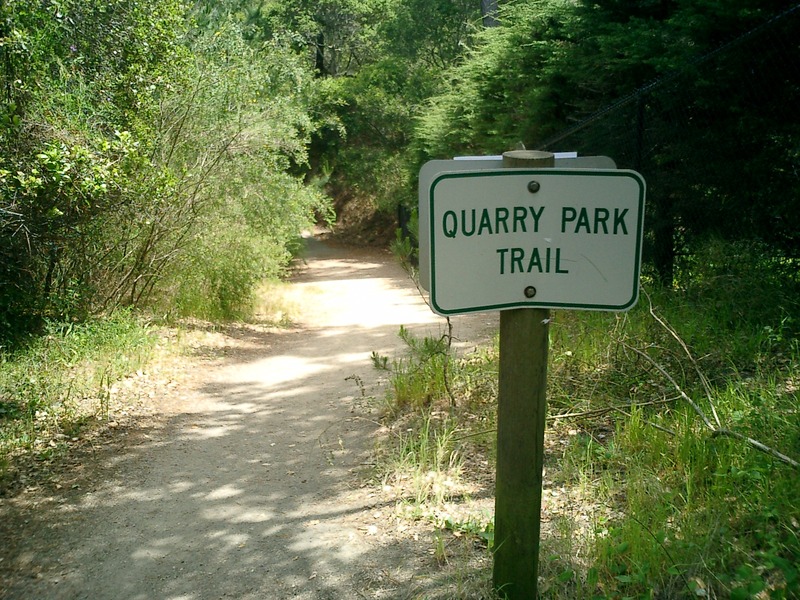 Back before the Huckleberry Ridge subdivision went in (in the ‘80s), Quarry Park and Veteran’s Park had all been one big de facto park with trails running all over the place – including along the route of the present Quarry/Veteran’s Park Trail – for as long as anyone could remember. 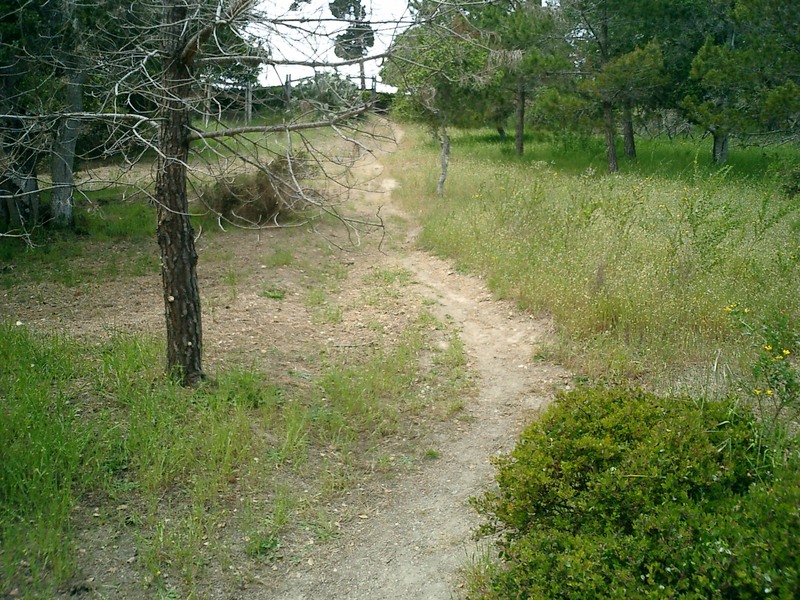 Monterey High even used these trails for their cross-country course. BUT … some of the land (basically the heart of the park) actually belonged to the school district (if our memories serve us well) and at some point in the ‘80s they decided to sell that land to developers. Those developers received permission from the city of Monterey to subdivide the land for private homes. One of the conditions of that permit was that the parcel now crossed by the Quarry/Veteran’s Park trail be placed in scenic easement and protected as open space. The permit also required the new neighborhood to form a homeowners association. The homeowners association was supposed to take title to the open space and either hold it as open space themselves or transfer it to the city to manage (we haven’t found anyone who knows whether transfer to the city was actually contemplated at the time the permits were issued or not). The developer (apparently a bit overeager to get the permit conditions signed off) then recorded a deed transferring the open space parcel to the homeowners association before a homeowners association had even been formed. The developer did later incorporate a homeowners association, but the neighborhood’s new residents apparently didn’t do anything with it and the Secretary of State dissolved it in 1983 after several years of inactivity. MEANWHILE, the construction of the neighborhood having blocked all other routes, the trail across the open space parcel became more heavily trafficked than in the past. Travel by this route was also made easier by the construction of a paved emergency access lane along much of the trail’s length. Years went by. People used the trail. People lived in the neighborhood. No one had a problem with that. 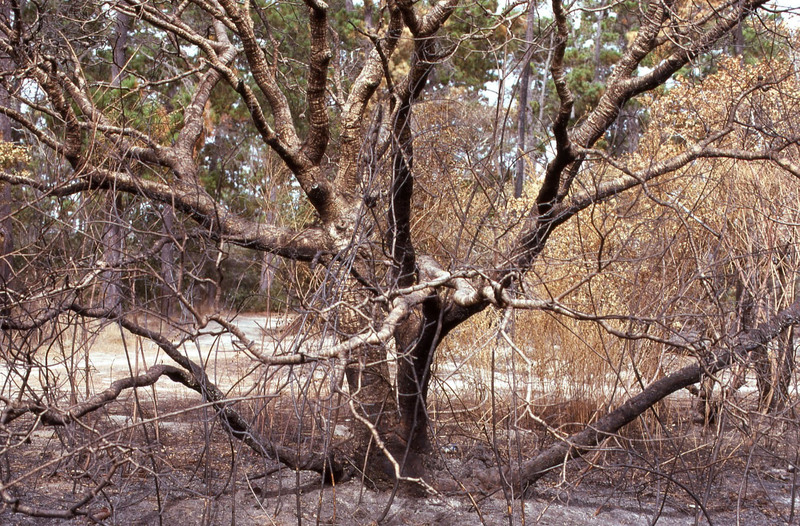 THEN, sometime around the year 2000, someone got curious about who was supposed to be maintaining the property (probably due to worries about fire since an understory of highly flammable non-native vegetation was building up) and it came to light that the parcel belonged to a non-existent homeowners association. The city then suggested that the neighborhood form a homeowners association and deed the property to the city so the city could maintain it as parkland. This idea sounded good to the property owners so they incorporated a new homeowners association (the Huckleberry Hill Homeowners Association) and formally offered the property to the city. BUT, there were two property owners in the neighborhood that didn’t like this idea and they sued the new Homeowners Association. Not wanting to step into the middle of this litigation the city declined to accept the property (a mistake they are no doubt regretting today) saying they would wait until the lawsuit was resolved. As the lawsuit dragged on, more Huckleberry Ridge homeowners began supporting the idea that the neighborhood should keep the property and the city was roped into the litigation as the property owners began to assert that the public had no right of access and that the city was obligated to maintain the property at no cost to the Homeowners Association. SOMEWHERE ALONG THE LINE, some Huckleberry Ridge residents apparently began confronting walkers on the trail and trying to prevent people from using the route. They, or the Homeowners Association, put up the silly No Trespassing signs warning walkers not to stray from the trail and bad feelings began to escalate. AT THIS POINT, the court has made preliminary findings that there is no formal easement for public access (not a surprise since the public’s right to use the route is based on historic use – not on a written easement) and that the city is not obligated to maintain the Homeowners Association’s property for them (again, not exactly a surprise). 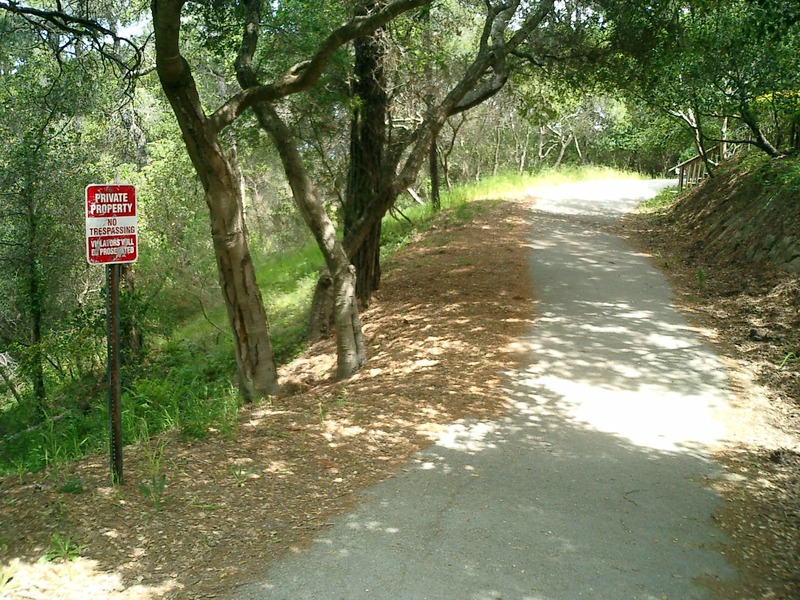 2) Give the property to the city, let the city maintain it, and chill out about people walking on the trail. Option 2 looks pretty sensible to us, but considering that they’re insane enough to spend their hard earned cash asking a judge to bar a Mother’s Day hike, we doubt common sense will be a factor in the decision. Oh yeah. And the judge turned down the request to bar the Mother’s Day hike. Find out more about it by checking the Save the Trail website. Update: Court Rules in Favor of Public Access! Another Update: Cops, Cake & Calochortus at 2nd Annual Mother’s Day Hike! This entry was posted on Friday, May 9th, 2008 at 9:00 am and is filed under Courts, On Foot. You can follow any responses to this entry through the RSS 2.0 feed. You can leave a response, or trackback from your own site. 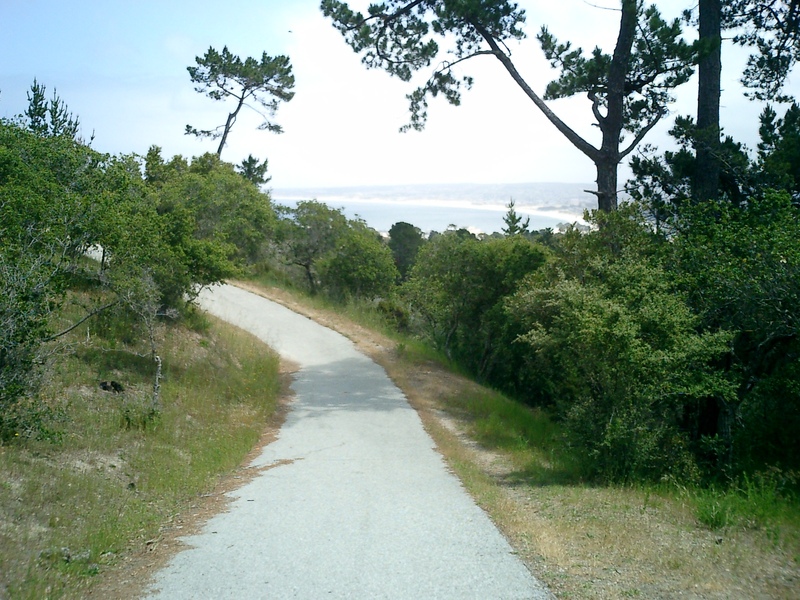 4 Responses to On the War Path in Monterey – An Xasáuan Today Investigative Hike! Nice, summary, Damn Boy, You can write……. A tremendous summation of the Abject Absurdity inherent in a possible shutdown of the Trail. This post is now linked on the RightToHike.org site, so be prepared for a server meltdown caused by the vast volumes of web traffic from that direction…. I knew there was a problem when I saw that bulldozer in the woods. Looks like the plaintiffs in the infamous Parcel B courtroom drama now have ninety thousand reasons not to complain about the outcome of the case.